Stuff4Sam recently bought some stuff for Sam! As a result of kind donations, splendid sponsortship efforts and ongoing book sales, we were able to buy Sam a walking machine for £4000 and an all terrain buggy for £2000. 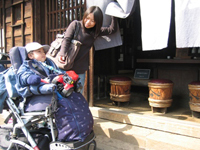 Kazumi: “We would like to say thank you to you all for your kind donation for Sam’s outdoor buggy and walking machine. Both are such valuable equipment which Sam loves so much. He loves watching himself walking in the mirror and it was really lovely for us to see Sam standing witout any hard support. We simply cuddled him and cried. 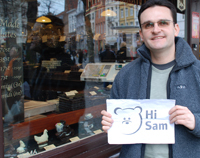 Hi from Sam in Japan! We went to Japan again in March and had a fantastic time again. Sam seemed to adjust himself into a new environment much quicker this time and enjoyed this exciting holiday so much. Sam had two lovely birthday parties while we were there and a lot of presents which made him really happy!! We visited Tomoko and Bobby family again and had a fantastic time with their three children, Thomas, Christopher, Sarah. Tomoko threw a lovely birthday party for Sam with delicious Sushi and cake, which made me smile as well!! However in Japan all Sam wanted to see was ‘a tractor’!! It proved to be a very difficult task in a big city like Tokyo and we were desperate in the end. Luckily my dad and sister live in the suburb of Tokyo where you can still find some fileds and farmers and at last we found a tractor there!! 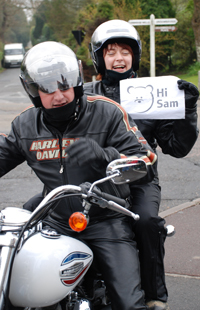 Sam was very happy – Phew! After two weeks’ stay, Sam started showing more interest in Japanese and now he demands Japanese songs in the car whenever we travel. We hope Sam picks up more Japanese as he grows, otherwise poor my dad will have no clue what Sam is talking about! We had lots of time together with my dad and Sam had plenty cuddles and kisses from JIJI (Grandad). It is always so nice to see my family so that he can learn his roots. 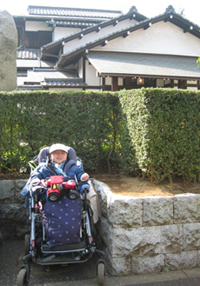 This picture was taken in front of an old Japanese house, where Sam found a nice parking space by the fence and reversed into there. The other one was a Japanese old pub. Sam was going to buy me a cup of Japanese Sake! 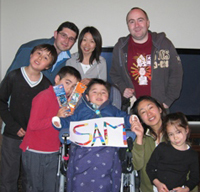 Back in December 2006 we had a party to raise money for Sam which raised over £2000! At the party we had an auction. Our good friend Neil donated his time and petrol by auctioning a ride on his Harley motorbike. A year and four months later (a-hem) we travelled to Tunbridge Wells so that Margaret and Jo who each bid for the Harley ride could do the deed! Here are some photos from the day. You can also listen to a podcast (mp3) from the day featuring the giant roar of the engine! A full write-up will be here soon. Hi Sam from a rather snowy Cumbria! We thought we’d go up the the lakes for Easter. We planned to have walks through the spring flowers, enjoying the sunshine, watching the lambs jump in the fields. Nope – it was freezing! We woke up on Easter Sunday to three inches of snow! It was very beautiful though and we enjoyed spotting all the snowmen that people had built in the fields. This photo is taken in a place called Coffs Harbour, Australia. They grow lots and lots of bananas here. In fact, they like them so much, they made this big banana, which is HUGE! You can even go inside it and find out all about bananas! Amazing! I’m not sure what this memorial was or why it looks like a filled-in window, but it was raining in Lille when we visited so we had to take a photo quickly before we got wet! Luckily I had brought my pack-a-mac so even when it snowed later on I stayed dry as well as looking stylish. We went to Lille on the Eurostar, which is the most exciting train ever – not only does it go very, very fast indeed it also goes underground and before you’ve eaten your lunch, you realise people are wearing odd trousers and talking funny – you’re in France! 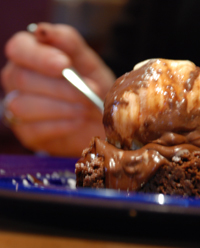 greetings from one of the many chocolate shops in Bruges, Belgium! We were amazed that they were selling chocolate in the shape of everything you could think of. We saw chocolate rabbits, chicks, eggs, even hammers but sadly no chocolate tractors. We went by Eurostar which went really fast! Hugh’s GPS showed that we got up to 180 mph at one point! 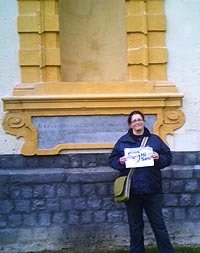 It was very cold in Bruges and we did lots of exploring of the old city. 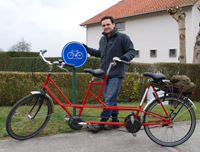 One day we hired a tandem and nearly cycled to the Netherlands by accident!